My eighth grade yearbook predicted that I would have a dual career as a lawyer and the starting quarterback of the Pittsburgh Steelers. As I look back, it occurs to me that my mistake was not in my ambition, but in my priorities. Lawyer first? What was I thinking? Lawyers get neither the money, the girls, nor the dedicated page on TMZ. Trust me, the absolute last thing you want to see on the internet is a 40 year old lawyer partying in Las Vegas, or frolicking in Tahiti. No one ever talks about a lawyer’s “out of the courthouse” antics. So why do sports fans care about “off-the-field” antics? In fact, we don’t. We forgave Michael Vick’s caninacide, after a great season in Philly. We welcomed Plaxico Burress and all of his offensive weapons, because the Steelers needed a receiver. Who could forget the allegations of sexual misconduct against Ben Roethlisberger? Just about every Steelers fan watching the 2011 Super Bowl, that’s who. And, everyone mourned the retirement of putative role model Ray Lewis. Poor Tim Tebow. His off-the-field behavior consists of prayer, confession, and charity. Yet, he was, arguably, the most compelling distraction to befall New York since, well, Jesus. Rob Gronkowski is, perhaps, one of the best tight ends to play the game and a likely hall of famer. Predictably, we have seen a lot of Rob this off-season, mostly featured in stories about his “off-the-field” antics. Or, on ESPN trying to defend himself from those who accuse him of excessive partying, or having too much fun. If this guy buys a beer in public, we are likely to read about it the next day. He is 23. And rich. And talented. And single. And a celebrity in his own right. And he has four brothers who love him – each one cooler than the next and they all look out for each other. He has achieved a stratospheric level of success that is literally every eighth grader’s dream. I spent a couple of days with Rob and his brother Gordie in Las Vegas. I sat at a dinner table with him and watched the chef offer specially-prepared meals, the owner ply him with free appetizers, men offer free drinks, women offer free, um, dating advice, and the hostess offer him a Diamond Knife to cut his prime rib. Even Darrell Revis – – the guy who was supposed to stop Gronk from catching passes – – had to drop by to pay his respects. I also saw the famous dance that landed him in the headlines. I saw the bar-tab and the parties. And, we all watched the round-the-clock coverage of his short vacation. We were incredulous at the negative press. And, the inaccuracies. He kicked a friend. He kicked a stranger. He re-injured his arm. He was out partying and drinking all night. In fact, he was with his brothers and playfully flipped one brother to the ground. He was not wasted and he did not injure his arm. It may be a minor point but who doesn’t wrestle with their brothers? Also, minor misstatements from the press are rarely insignificant. The story doesn’t quite sell as well if it is framed as ordinary horsing around. Here is what he will never tell you. He spent four hours each day in the gym carefully working out after a long rehabilitation. Four hours. I cannot think of a single thing that I can do for four hours. This guy cares about his body. He cares about his team and his career. And the fans. Trust me, I am sure he would have preferred to sleep in but his work ethic and his commitment to his fans wouldn’t abide such reasonable behavior. He spent quite a bit of those two days working out the details of several upcoming charitable events that he was quietly sponsoring. He has a charitable foundation that he deeply cares about but he only talks about it publicly if it will expand its reach. He talked a lot about his family and it soon became clear that the Gronk is a family man. A dedicated and loving son. And, he and his brothers care about each other in a way that you just do not expect from anyone, let alone such fiercely independent (and large) men. Perhaps most impressive was the patience he showed with fans. I did not see him turn away a single autograph seeker. He did not turn down a single request for a picture. And, if the image was blurry, he laughed and took another. I had trouble sitting through the first ten requests while he must have smiled through about 100. And, that has to happen everywhere he goes. Over two days, I saw a role model. A guy who loves his fans, his team, and his teammates. An athlete thoroughly committed to success and to the game. One terrible truth emerged: this life-long Jet-fan and Patriot-hater is going to be seriously conflicted next season. And, so, for the next few months, I watched with surprise as commentators, sports writers, analysts, bloggers, and even fans, questioned Gronkowski’s work ethic, personality, and commitment. Even his sanity. I came to the following truth. As a society, we crave heroes. But, role models are too damn boring (Tebow). You know what isn’t boring? Bad men acting badly. So, we have invented a counter-culture by which we highlight the lack of role models by attacking anyone who might qualify. It is a self-fulfilling process. I do not know if movie-stars or athletes deserve to be role models simply because they can act or catch a football. I would love for my children to aspire to professional success by following the paths of those who excel in any career. That does not mean I want them mimicking the off the field behavior of those very same people. There are those who merit our scorn – – even while we cheer for them to win the game for us. There are those who merit our respect, even if they couldn’t quite fulfill their NFL dreams. And, then there are the role models – – those who can balance both personal integrity and professional success. We need to embrace those people – – even if they occasionally but responsibly let off steam and engage in reasonable distractions in their personal time. We all do it. Let’s vilify the villains and cultivate the heroes. Thanks to you, this blog has reached unimaginable successes. Over 260,000 readers. It was mentioned on WCBS radio and CNN. The feedback has been great – – even when I totally disagreed. So, thanks for that. Please take a moment now, go to the home page, (aweisbrot.wordpress.com) and enter your email address on the right side in order to subscribe to the blog. You will ONLY get an email when I post a new entry. That’s it. And, if you like what you read, please take a minute and send this link to your friends. I enjoyed your post very much. I get so tired of reading negative things about innocent situations that he is in. If I was 23 and rich and gorgeous, theres no telling what kind of trouble I would find myself in, but he seems to be a genuinely good person that just enjoys all that he has been blessed with. The last guy that did this type of interview where they spent a few days together seemed to take advantage of his trusting personality and wrote an article criticizing everything the man did. I was just disgusted. He’s not hurting anyone. In fact he makes alot of people happy so haters just need to get a life. Anyway, great job! Finally someone who gets down to the realization that Mr. Gronkoswki is just 23 years old and acting his age. As the mother of a 23 year old son and being one of ten children myself I can only laugh when I read about some of Gronk’s antics as I think “it’s all in clean fun”. My mother probably wanted to throttle us more than once a day when we were all in the same room, even as adults with children of our own. Just as much as I grin and bear it with my 23 year old whom, I have no doubt, had he the money would be doing “all that” and then some! Get well Gronk, we New England fans miss you. Still prefer Tebow over Gronk, but that’s me with a teenage daughter who loves these athletes. Glad she doesn’t always gravitate to the spoiled, rich 23 year olds. Thanks for sharing, I really enjoyed this post. It’s rare to hear a different perspective from what is being reported. Everyone was 23 once but not everyone knows the work and responsibility involved in being at the very top. Thanks, Ari. Outstanding post. Really appreciate you sharing this experience. I didn’t have first-hand knowledge of Rob’s off-field behavior but took exception to the way he was being portrayed by the media. Wish ESPN would pick up your story… but as you pointed out, it’s not in their interest to do so. Thanks again. I dont know since i am not a woman. But i would guess he is. Is Rob respectful towards women? I’m just curious. The media makes it sound like he’s jumping in bed with a different girl every night. I wondered how true that was? Just happened to stumble on this article. 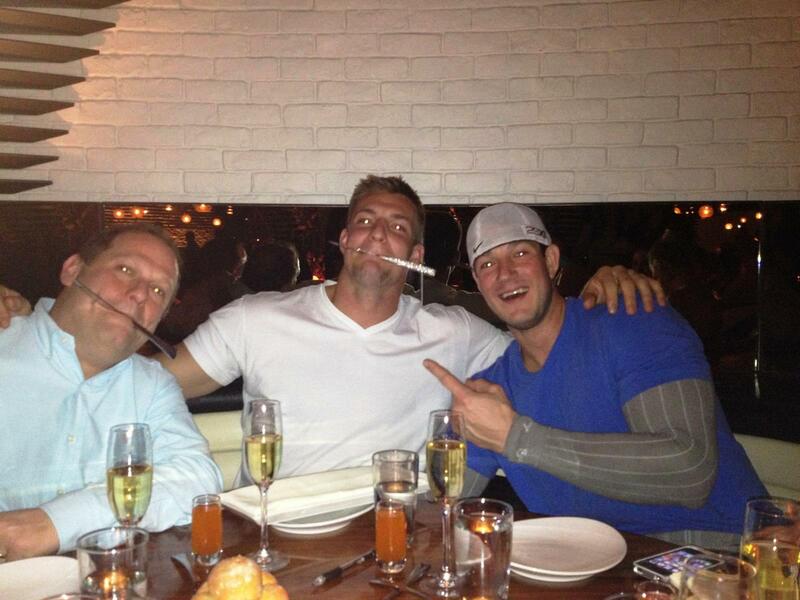 So you consider Rob gronkowski a role model? In some ways he is & in some ways he is not. Just curious; if you had a daughter (18 or older) would you be okay with her dating him? Depends what she looked like.